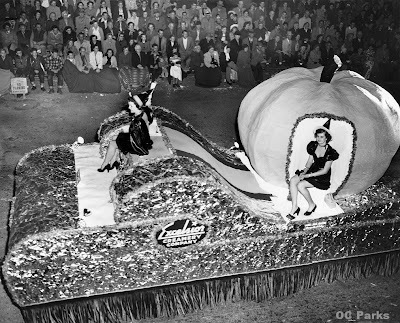 The photo above shows the Excelsior Creamery float in the Anaheim Halloween Parade, probably sometime in the 1940s. 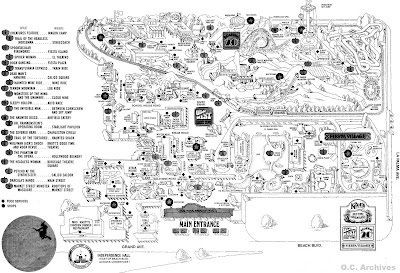 The map below is from one of the earliest Halloween Haunts at Knott's Berry Farm, in 1976. I recently stumbled across this image in U.S. Geological Survey's online photo library. 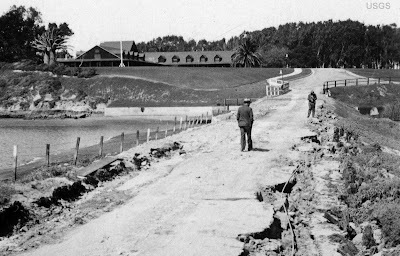 It shows the Bolsa Chica Gun Club in Huntington Beach, just after the big earthquake of 1933. (Note the huge crack long the road.) Until yesterday, I didn't know the USGS even had a historic photo collection like this, but man do they have some cool stuff! And what makes for a more charming anecdote than rich Angelenos slaughtering waterfowl? In fact, there were something like 13 gun clubs (a.k.a "duck clubs") in the Bolsa Chica area alone, to say nothing of all those near Irvine or in the marshes between Huntington Beach and Costa Mesa. Most members were rich businessmen from Los Angeles. After work on Friday, he would take the Pacific Electric or hitch a ride in a friend's "machine" down to Bolsa Chica. Taking an automobile let him avoid a dark, two-mile ride from the P.E. stop to the Club in a mule-pulled wagon. On the other hand, it meant sharing the unpaved roads with innumerable slow wagons hauling sugar beets to the Alamitos sugar factory. Once at the Club, he met with other members who would be shooting the next day. They had a hearty dinner together and selected blinds for the following morning. After dinner, members spent the evening chatting, reading, playing card games and relaxing before going to sleep. The keeper awakened each of them with a rap on their doors at 5:00 a.m. They put on their hunting gear, ate breakfast, and headed out into the darkness toward their blinds. Thirty minutes before sunrise, a bell rang, letting everyone know they could begin blazing away. Initially, they might see no game, but would hear a few guns popping in the distance -- sometimes at neighboring clubs. At this point that Graves regales us with a depiction of the slaughter and maiming of innumerable waterfowl -- All against the backdrop of the great outdoors and a glorious sunrise. By noon, most of our mighty Nimrods had bagged their limit. Having once again defended democracy against a potential duck incursion, they retired to Bourbon and cold showers at the Club. This was followed by a "good hot lunch" before making the drive back to Los Angeles. Good news! First American Corp. -- which has one of the best collections of early Orange County photos anywhere -- is beginning to put some of their images online. 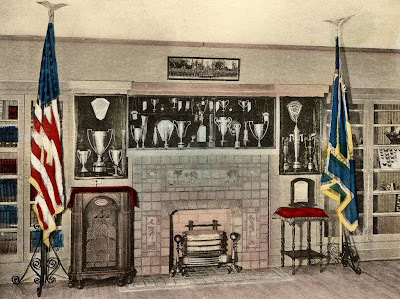 Their website lacks captions, but it includes some great old photos. I'm posting two of them here today. 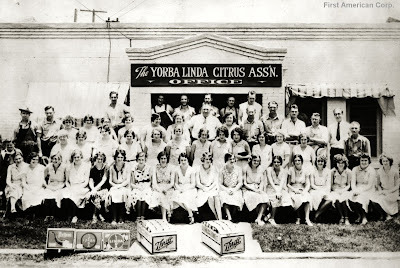 Above is an image of employees of the Yorba Linda Citrus Association. 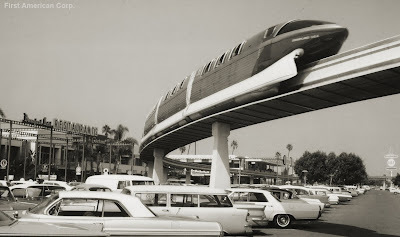 Below is a circa 1960s image of the monorail leaving the Disneyland Hotel. They've also posted a short video about the history of First American, which is worth a look. Let's hope this is just the beginning! 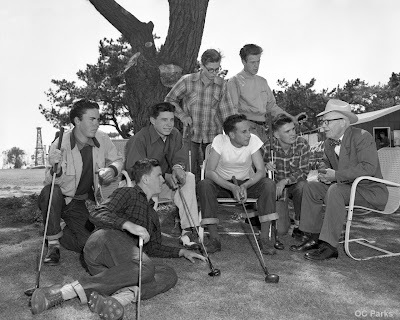 Today's photo shows Coach Lloyd H. Hamren (1886-1975) and the Huntington Beach High School Golf Team on May 2, 1951. Coach Hamren looks like he must have been quite a character. The municipal golf course -- which was adjacent to the High School -- is all condos now. But what isn't? 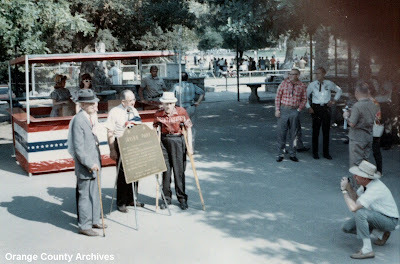 Ken at OutsideTheBerm just posted a nice piece on Forrest Morrow and his "Woodimals," which once resided on Knott's Berry Farm's Jungle Island. "However, on the authority of John P. Harrington, a research assistant of the Smithsonian Institute, there is a grain of support for the old Devil theory, if not the name that goes with it. "'Years ago [wrote Harrington], I had a unique experience. I drove with an old Indian from Olive up the Santa Ana River Canyon. Pretty soon after leaving Olive we seem to have been on the north side of the Santa Ana River. We went through a big kind of low place. The Indian said that that was the devil's house, that the devil lived there in the form of a whirlwind, and that a whirlwind is often seen there...'"
Jim also cites Fr. St. John O'Sullivan's interview with Dona Magdalena Murillo (who was born on the Rancho Las Bolsas in 1848), in which she explains that the wind got its name because it "came down the Santa Ana Canyon." Also, Jim points out that the first instance of the term "Santa Ana winds" in print, was in the April 12, 1873 Anaheim Gazette. So I'm voting for "Santa Ana winds," even if the Santa Ana Chamber of Commerce doesn't like it much. Long before there was a "Knott's Scary Farm" or "Halloween Haunt," the folks at Knott's Berry Farm clearly knew how to get into the spirit of Halloween. 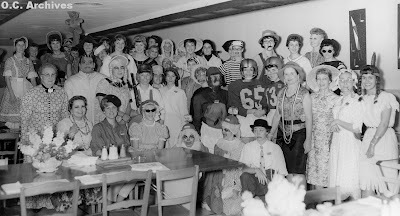 The photo above shows the staff of the Chicken Dinner Restaurant on Oct. 31, 1960. There weren't many days left until the presidential election. 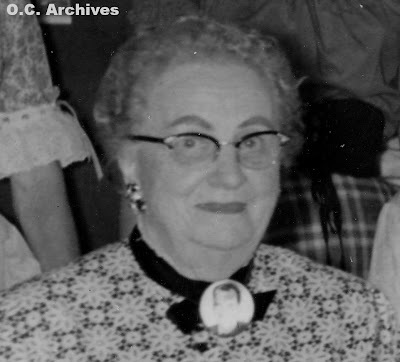 Note the "broach" Cordelia Knott wore on her costume in the closeup image below. Squint hard and you'll recognize it as a campaign badge for Orange County's own Richard Nixon. St. Catherine's, Balboa Island, Vans, Catalina, etc. Today's image is an old postcard from Tom Pulley's collection, showing the library of St. Catherine's Military Academy in Anaheim. I love the old radio and the tile around the fireplace. Today was a good day for stumbling across things I wasn't expecting. First, I learned there's a Balboa Island Historical Museum. It's open Wednesdays and Saturdays, 10am-2pm, at 502 S. Bayfront, Suite A (upstairs). They ask that you "please call to confirm the hours: (949) 675-3952. Or to make an appointment: (949) 723-4226." First, there's Catalina by Sea: A Transportation History (2006) by Jeannine L. Pedersen of the Catalina Island Museum. It's an Arcadia Publishing book that includes material on the boats between Catalina and various ports, including Dana Point and Newport Harbor. Also, there's Vans: Off the Wall: Stories of Sole from Vans Originals by Vans Vice President of Marketing, Doug Palladini. Vans has been an Orange County institution since they began as the Van Doren Rubber Co. in 1966. They opened their first store here, made their shoes here, and are currently based in Cypress. By the way, the L.A. Times has an article about the two Depression-era paintings that survived Newport Harbor High School's recent discombobulation. Nice that something did. Taken in 1958 to document a road construction site, this photo from the Orange County Road Dept. almost looks like it was staged. The boys are crossing Coyote Creek in La Habra, near Lambert Road. 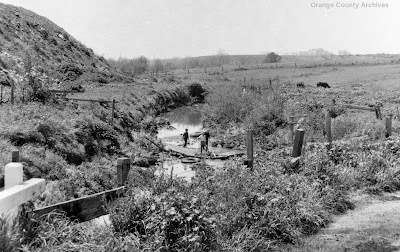 Today's children, of course, will never be endangered by makeshift bridges, polluted creeks, harmful UV rays, or scary farm animals. They will remain safely in their beige stucco boxes, playing video games and watching "educational" television. Historian Doris I. Walker will be the guest speaker at the Dana Point Lighthouse Society meeting on Oct 22. She'll preview her newest (12th) book, Images of America: Orange County, A Natural History. The meeting will take place at the Dana Point Tennis Center, 24911 Calle De Tenis, 6:00-7:30pm. Thanks to the folks at Arcadia Publishing, I've already seen the book. It includes many good images I've never seen in print before. And although she's mostly limited to captions, Doris' winning writing style shines through. Speaking of books, I just finished The Happy Bottom Riding Club: The Life and Times of Pancho Barnes, by Lauren Kessler. It's a history of one of the first female aviators and her enormously colorful life. It's not a new book, but it was new to me, and I wanted to point it out. Barnes' Orange County connections included her beach house and air strip at Laguna Beach, and her visits to Martin Field and the Orange County Airport. Someone has started a new Yahoo! Group for Orange County history. Click on over to check it out. I look forward to seeing what this grows into. And while we're on the subject of online resources, I see the Orange County History group on Flickr has reached 145 members and well over 2,000 entries. I love to check in and see what other people are sharing. With my new computer mostly working, I'm once again able to do some video editing. I've already posted two videos of the 1938 flood to the O.C. Archives' Flickr site, and two videos from the Allison Honer Collection (showing the building of Buffum's annex in Santa Ana and the building of the Buena Park Mall) for the Orange County Historical Society's Flickr site. Huntington Beach, Don Nixon, Katella Ranch, etc. 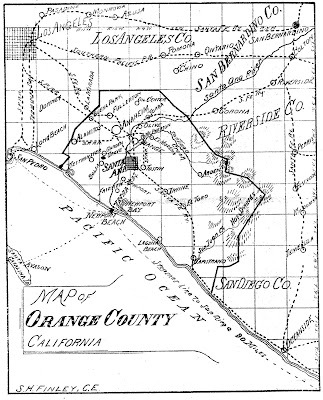 Here's a small map of Orange County from about 1900. Nifty, no? Vic at Photos of the Forgotten posted a nice postcard image of Presidential brother Don Nixon's restaurant, and then linked to a interesting article about Don's Orange County chain and the hornets nest it stirred up. See the article at Restaurant-ing Through History. Artists Kevin Kidney and Jody Daily have restored some interesting architectural details from Anaheim's historic Rea House. (That's Rea as in Kate and Ella Rea. Kate. Ella. Katella. Get it?) Read about it on Kevin's blog. Irvine Park, MCAS Tustin, OCN, cemeteries, etc. 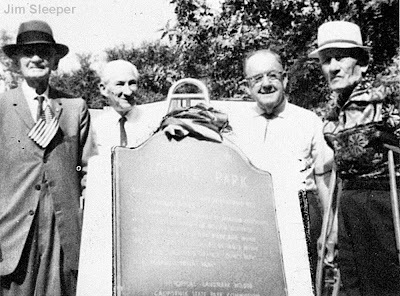 "In 1967, Irvine Park turned seventy. To honor that milestone, some 1500 well-wishers gathered on October 7 for an old-fashioned celebration. ...Prominent among the honorees were longtime county supervisor Tom Talbert, then 89, who fathered many park improvements... retired custodian Fay Irwin, 69, whose family had tended the place for 40 years; businessman Jim Liebig, 97, who got Irvine's permission to change the park's name; and historian Don Meadows, 70..."
There's young Mr. Sleeper taking the photo that appears in the book! Griselda Castillo, who has been overseeing some of the County's historic parks since Rob Selway's retirement, has now been named Manager of Historic Parks for the whole system. I wish her luck with what seems a daunting but potentially very rewarding job. The Dreger Clock was finally officially unveiled to the public. Photos of the dedication are posted on OutsideTheBerm. Casa Romantica has named Lisa Merryman as their new interim director. A large mountain of "Beta" videotapes have been delivered to the Orange County Archives, comprising the 10-year run of the Orange County Newschannel (OCN). Of course, it's going to take a lot of time, work, and antiquated equipment to make this material available to the public in something resembling a useful format. The Santa Ana Historical Preservation Society will hold their annual Historical Cemetery Tour on Oct 17, with tours from 10 am to 3 pm. This guided historical tour of Fairhaven Memorial Park and Santa Ana Cemetery features costumed actors portraying historic figures who share stories from Orange County’s past. This year's program is entitled, "What's In A Name?" More information is available on the SAHPS website.